The KONG HandiPOD Pick Up Bag Refills are high-quality poop bags. They have handy handles and are biodegradable. The poop bags can be used separately or in combination with the HandiPOD products. Each roll contains 15 poop bags. You will receive this pack in 4 rolls. The HandiPOD Pick Up Bag Refills from KONG are high-quality poop bags that are biodegradable and have handles. These poop bags can be used separately or in combination with the other HandiPOD products. This pack contains 4 rolls of 15 poop bags each. The HandiPOD Pick Up Bag Refill is also available as a mini variant. These poop bags can be used separately or as a refill for the KONG HandiPOD Starter Kit, KONG HandiPOD Flashlight Dispenser and the KONG HandiPOD Clean Dispenser. 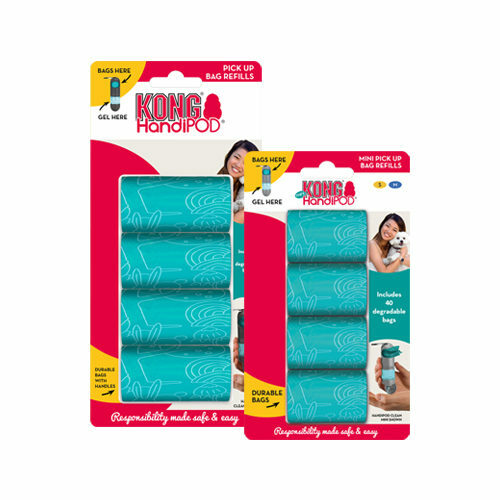 Have you used KONG HandiPOD Pick Up Bag Refills before? Let us know what you think about this product.